How Do You Write a Rule for a Geometric Sequence? Trying to find the value of a certain term in a geometric sequence? 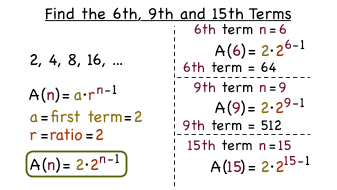 Use the formula for finding the nth term in a geometric sequence to write a rule. Then use that rule to find the value of each term you want! This tutorial takes you through it step-by-step. How Do You Determine if a Sequence is Arithmetic or Geometric? You have a pattern in your sequence. Great! Think it might be an arithmetic or geometric sequence? If the sequence has a common difference, it's arithmetic. If it's got a common ratio, you can bet it's geometric. Practice identifying both of these sequences by watching this tutorial!